SNOW MIKU 2018 | “SNOW MIKU (Hatsune Miku)” festival livens up Hokkaido in winter! SNOW MIKU (Hatsune Miku)” festival livens up Hokkaido in winter! “SNOW MIKU 2018” is a festival in which “SNOW MIKU (Hatsune Miku)” enlivens Hokkaido in winter. 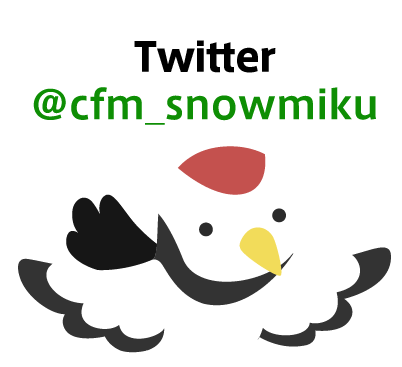 As Crypton Future Media, INC., the company that planned and developed “Hatsune Miku”, is located in Sapporo, Hokkaido, “SNOW MIKU” festival has been held in Hokkaido every winter since 2010. This winter, for its 9th anniversary, the festival will feature various events in which people can enjoy Hokkaido. See here for SNOW MIKU 2017! AEON Hokkaido Co.,Ltd. / Atelier Magi Co.,Ltd. / BANDAI CO.,LTD. / Bunkyodo CO., LTD. / COCOLLABO / COSPA / DAIHATSU HOKKAIDO / Daiichi Gomu Co., Ltd. / ENSKY CO., LTD. / EZOCA / FUJIMIMOKEI.Co., Ltd / FUJITSU LIMITED / Gift Co.,Ltd. / Good Smile Company, Inc. / gumi Inc. / GungHo Online Entertainment,Inc / Hashimoto Shitsugei Co,, Ltd / Heart Corporation / HOBBY STOCK / Hokkaido Arbeit Johosha Corporation / IDEA CREATE CO., LTD / Japan Post Co., Ltd. / LAWSON / MaxFactory / MIRAIT Corporation / movic / NAGATOYA CO.,Ltd. / Nippon Inter Create. inc / nORBESA / Rohto Digi-Eye / SD ENTERTAINMENT ,Inc. / SEGA Interactive Co., LTD. / Sony Music Communications Inc. / STAIRS Corporation. / SUMITOMO MITSUI Card Company / Taito Corporation / TAKAHASHI GROUP / THE HOCHI SHIMBUN / UNIFAST co., Ltd. / VOCALOID Keyboard / VOLKS INC. / Warner Music Japan Inc. / Washin CO.,LTD. / WonderPlanet Inc.